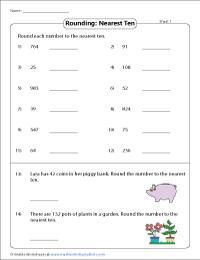 Rounding worksheets have productive pages on rounding whole numbers to the nearest ten, hundred, thousand, hundred thousand and million. 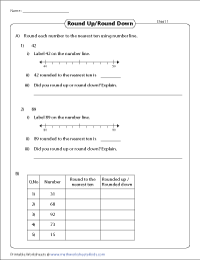 Also, MCQs on rounding to its nearest place value; rounding up and rounding down; matching the rounded number; rounding using a number line and more skills are given for practice. 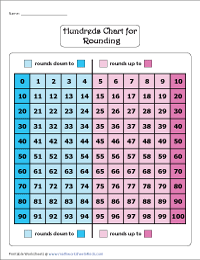 Hundreds charts for rounding are given in three different ways. Study these colorful charts and know how to round up and round down the numbers. 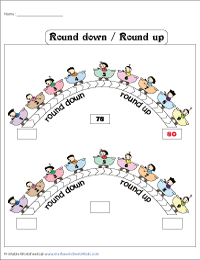 Amusing charts are displayed in different themes such as roller coaster, terrain road and seesaw which make children easily understand the round up and round down concepts. Round the given whole numbers to the nearest ten. Two-digit and three-digit numbers are used. Word problems are included on this page. Indicate the given number on the number line and round it to its nearest place value in section A. In section B, round the given number. Also, indicate if it is rounded up or rounded down in both sections. 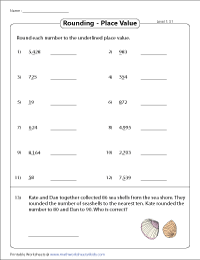 Each rounding worksheet has numbers up to three-digits. Round these numbers to the nearest hundred. Word problems are also included. 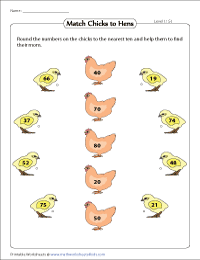 In these rounding worksheets, help the chicks, puppies and kittens reach their mothers by rounding their numbers to the nearest ten and hundred. 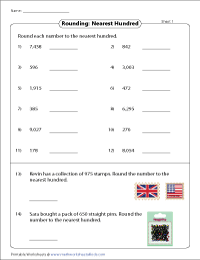 Three-digit and four-digit numbers are to be rounded to the nearest thousand in these worksheets. Two word problems are given for practice. Round each number to its nearest ten, hundred and thousand. Tabulate the rounded numbers in these columns. Round the whole numbers according to the underlined place value. 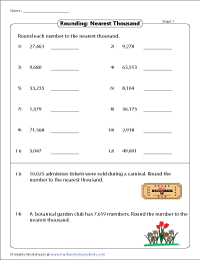 Round numbers up to hundred in level 1 and up to thousand in level 2. 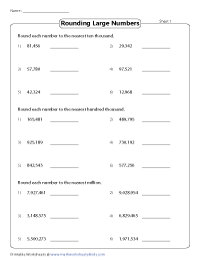 Each worksheet has one word problem for practice. Indicate the given number on the number line. Check the number which is close to the given number and round it to the nearest place value. 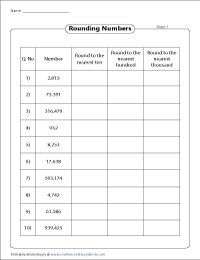 Know more about rounding by marking all the correct responses that round the number to the given place value. 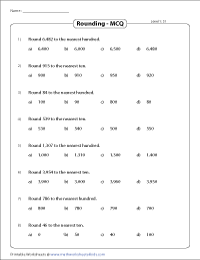 The worksheets on rounding whole numbers to the given place value have MCQs based on two levels. Level 1 have numbers up to hundreds and level 2 has numbers up to hundred thousands. Challenge your students! Round the large numbers to its nearest ten thousand, hundred thousand and million.